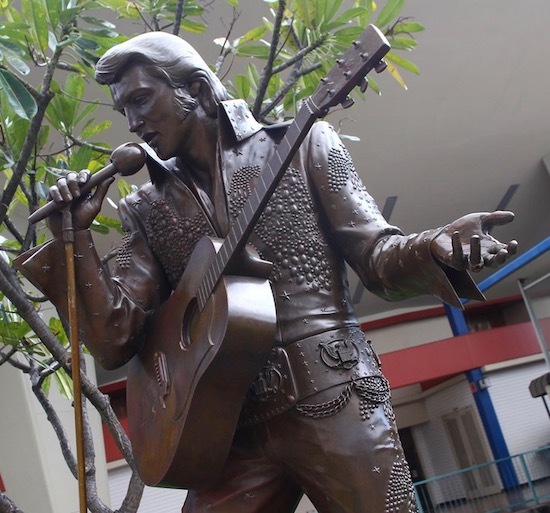 Some in Mississippi Are Suggesting an Elvis Statue in Washington, D.C.
An Elvis Statue in the U.S. Capitol? It’s remarkable how often Elvis Presley’s name pops up in random news stories. It’s a consequence, of course, of his continuing influence on popular culture in America. Recently the king of rock ’n’ roll got involved in a political dispute brewing in Mississippi. “Is Elvis Headed for the U.S. Capitol?” was the headline over an article by Jerry Mitchell in the Jackson Clarion-Ledger in March 2017. It concerned a controversy that had arisen about how the state of Mississippi is represented in the U.S. Capitol in Washington D.C. In that hallowed building, visitors can view two statues representing each state. Davis, of course, was the president of the Confederacy, and George, while the state’s governor in 1890, helped write Mississippi’s constitution that was designed to prevent African-Americans from voting through the use of poll taxes and other restrictions. In 1931, the state provided the U.S. Capitol with statues of the two men, neither of which was actually born in Mississippi. Although some object, calling it “revisionist history,” some state political and academic bodies are open to discussing the possibility of replacing one or both of the state’s statues in Washington, D.C. States have the option to switch out their statues, and seven states have done so in the past. If Mississippi decides to make a change, one being suggested as a replacement is Elvis Presley. Other candidates put forward include blues musician B.B. King, authors William Faulkner and Eudora Welty, and civil rights activists Medgar Evers and Fannie Lou Hamer. The approval of both the state legislature and the governor would be required for the state to change its statues in the U.S. Capitol. Current Governor Phil Bryant recently mentioned that Presley and King “would both be good possibilities for a replacement.” The executive director for the Mississippi Arts Commission, Malcolm White, said that if the main criteria focused on “most influential,” he would pick Presley and Faulkner. Obviously, it would be a great honor for Elvis Presley to be chosen as one of only two Mississippi natives to represent the state with statues in the U.S. Capitol. Of course, much debate and political maneuvering would be required to make that happen, but let’s consider the argument for Elvis’s selection for such a tribute. 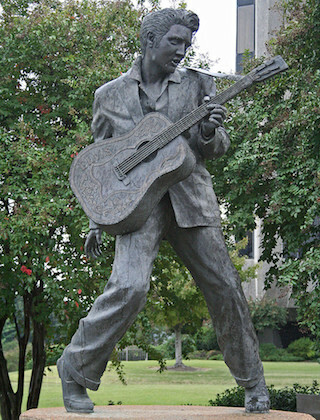 It starts with Elvis Presley’s influence on popular music in the 1950s. As Elvis often admitted, he did not create rock ’n’ roll music. What he did, however, was to popularize it and make it the music of the baby boomer generation. To the mixture of rhythm and blues, country and western, and pop music, he added an energized sexuality that gave teenagers permission to express their individuality in an era when society stressed conformity. 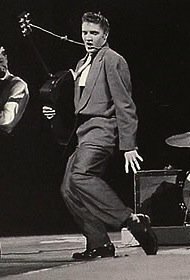 He led rock ’n’ roll’s assault on the music charts in the fifties, opening doors from other young singers, both white and black, to also sell millions of the new smaller vinyl discs with a big hole in the middle. Elvis spread the word of rock ’n’ roll through old and new methods. He used a door-to-door approach, crisscrossing the nation with his stage show. At the same time, he was the first entertainer to use the new medium of television to reach out to the nation’s youth everywhere. By playing in outdoor athletic stadiums during his tours in 1957, Elvis provided a blueprint for the large concert shows of the 1960s. Elvis Presley was not just a flash-in-the-pan singer. He also had a successful career in Hollywood. Certainly he was not as influential in the film industry as he was in pop music, but he did star in 31 theatrical films and two documentary features. His screen work in the fifties and sixties enhances his resumé as the country’s greatest entertainer during his lifetime. Then there is his record-setting return to live performances in Las Vegas beginning in 1969 and the sold-out concerts in cities across the country in the seventies. 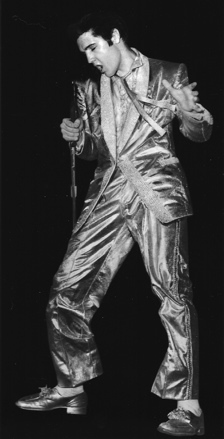 For the record, Elvis Presley performed 641 Las Vegas shows and gave nearly 500 other stage shows in 42 states between 1969 and 1977. His career accomplishments on the record charts are unprecedented during the vinyl era. Between 1956 and 1977, 133 Presley recordings appeared on Billboard’s Top/Hot 100 pop singles charts. Over a hundred of them penetrated the top 40, and 38 reached the top 10. Elvis had 14 #1 singles between 1956-1969. There’s no way of knowing just how many millions of records he sold nationally and across the world during his career. Other credits can be added to the list of accomplishments that make Elvis Presley one of Mississippi’s greatest contributions to America’s story. He set aside his lofty career for two years to serve honorably in the U.S. Army. I’ll let you read elsewhere on Elvis History Blog about Elvis’s many charitable activities. He’s a charter member of the Rock and Roll Hall of Fame, and his Graceland home in Memphis remains one of the most visited private homes in the U.S.
Of course, detractors will point to the drug use and bizarre behavior that marked his final years. Also, it will be noted that he left Mississippi at age 13 and that all of his accomplishments occurred while he was a resident of Tennessee. Still, Mississippi can rightfully claim Elvis Presley as a native son who never forgot where he came from. Elvis Presley’s life, with all of its ups and downs, is an uniquely American story. Raised in poverty, he rose dramatically to the top of the entertainment business. He disappeared from sight when he went into the army, with no guarantee that his career could survive two years of exile. When he returned to civilian life, he reinvented himself as a movie star and a mainstream pop singer. When his Hollywood career faded, he reinvented himself again on the Las Vegas stage. Even his tragic final years and early death are a testament to the pitfalls of fame in America. 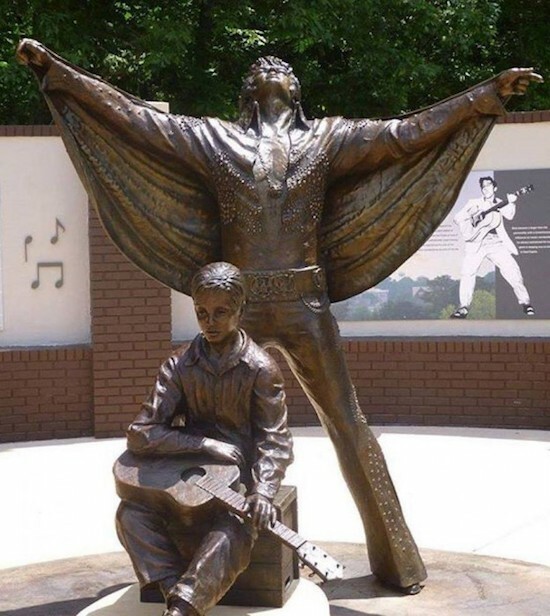 "Should the state of Mississippi honor Elvis with a statue in our nation’s Capitol, visitors from every state would be well served to spend a few moments in contemplation viewing his image there."